Pretty Girls: a feminist perspective through art is a collaborative project celebrating over 10 local artists and their viewpoints on artistic, intellectual and political feminist influences. 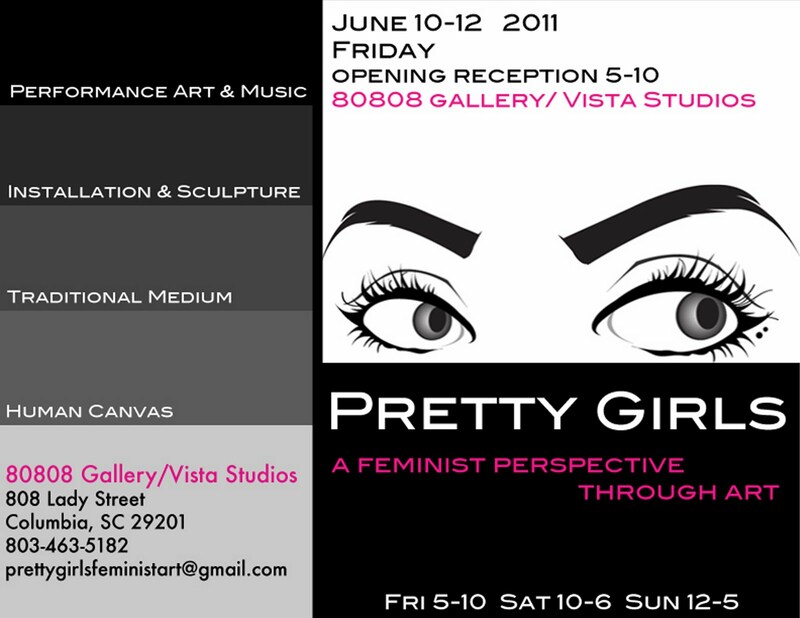 The opening reception will be held Friday, June 10th from 5pm-10pm at Gallery 80808 Vista Studios. Witness an exciting range of artistic interpretations from performance art, music, film installation, sculpture, traditional medium and…human canvas! The exhibition does not embrace a traditional definition of feminism, but showcases through diversity of ideas that the perception of a fixed feminist point of view has changed. If you miss the opening reception there will be studio hours from 10-6 pm Saturday and 12-5 pm Sunday. We look forward to exploring the feminine identity through forms of art with our community and friends. This feminist art event brings attention to the importance of providing a safe environment for women in crisis by donating a portion of the proceeds to The Women’s Shelter of Columbia, SC. Please stay-tuned on Facebook for further updates and details of the opening reception. Get Involved: If you would like to become involved with Pretty Girls: a feminist perspective through art, contact Olivia Thompson through [email protected] or (803)-463-5182. She is available for interview. I am here helping to set up and WOW! You will be surprised. Don't miss this exciting show. 15 Artists, all with different mediums including live body art and Pin Up Girls! There will be music and refreshments.